At the public library where I work I usually organize the popular music displays. I mainly do it because I am the person in my department who is the most interested in non-classical music but also because I am an unregenerate rock fan. One of the most successful displays I have done I call era rock. One month I highlight sixties rock, the next month seventies, and finally eighties. I don't do nineties. I need to study that more. I have noticed that I clearly prefer seventies rock above all the rest. The music of this era is, to me, the most classic of its genre, the most hip. Even the hair looks OK. Now you could argue that these are classic designs, but they are (mostly) ALL classic. I think being French helps. Also note the tank above right. 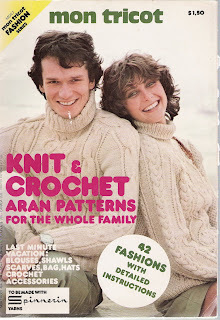 An almost identical pattern is in the current Interweave Knits. Recently I came across an additional seventies resource, also of European origin, this time Deutsch. This is the Make it Yourself crafts library published in volumes (I don't know how many) and distributed in the U.S. by Columbia House. This is also mid-seventies. Not quite as stunning as Mon Tricot, these volumes include sewing, embroidery, and other crafts in addition to knitting and crocheting. The cover looks aren't that great, but the hoodie and scarf could have been published yesterday, down to the color. 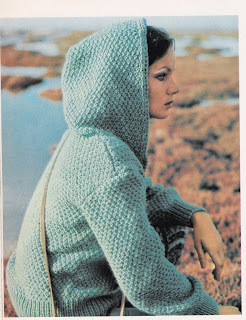 Next post, I go deeper into the seventies. 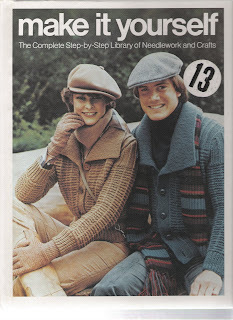 I think those giant tall turtlenecks are definitely dated - I don't think anybody has worn one of those since 1983. 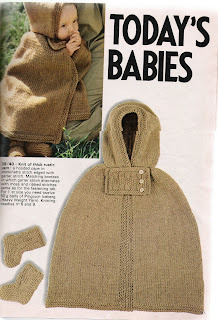 And that hobbit baby cape thing is just weird. Please tell me you are not making that for any babies we might know. Do you have the "make it hoodie" pattern? I love that thing!